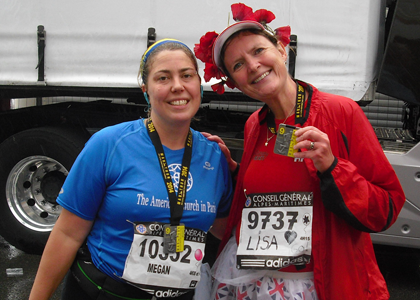 ‘Never again!’ That’s the motto of many a marathon virgin after their first 26.2 miler. And it’s usually mine too after I’ve run a marathon in a foreign city. I seldom run the same marathon twice, preferring to experience new routes and, truth to tell, remain blissfully ignorant of any slog-it-out that might lie in store! 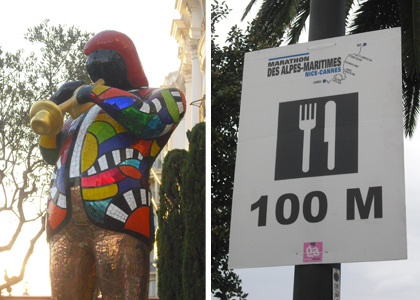 But I made an exception for the Marathon des Alpes-Maritimes Nice-Cannes for two reasons: it takes place along one of the world’s most beautiful coastlines (none other than Matisse and Picasso agree with me on that!) and the route has only two notable inclines (one at 29K and another at 35K). 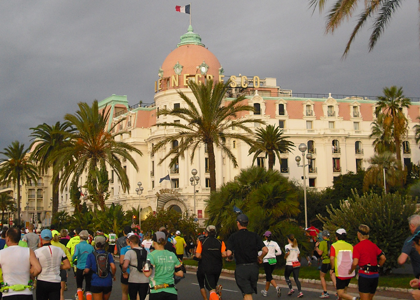 This race is also a firm favourite of mine because it’s run around two bays – the Baie des Anges and the Bay of Cannes – meaning it’s one of the few marathons I know of where you can get the satisfaction of seeing just how far you’ve come, and how far you still have to go. The course started on the celebrated Promenade des Anglais and headed past über-glam hotels such as the pink-domed Negresco where a statue of jazz legend Miles Davis (Below left) playing the trumpet gave us a fitting send-off. Once past the airport the next target was the Marina Baie des Anges, surely one of the world’s swankiest apartment complexes. Designed to look like four giant white waves, it curls around a spectacular harbour crammed with the yachts of the rich and famous. At about 10K I was joined by Megan Staley, an ever-cheerful American runner now living in Paris, who certainly knew how to put a smile in every mile by chanting ‘Going uphill’ every time we encountered an ascent (even when it was just a speedbump!) and shouting ‘We love running!’ whenever things got challenging. I usually walk/run marathons, but with Metronomic Megan by my side, I managed to stay hot to trot throughout. A little after halfway we came to the most scenic part of the course which cuts across the Cap d’Antibes peninsula through the pine forests that Picasso painted in 1946 while staying at the nearby Château Grimaldi. And when we reached the Bay of Cannes after a wonderfully winding downhill section (which I pretended to fly down, arms outstretched, to impress the drummers waiting at the bottom) we saw the cutest little beach imaginable that’s just big enough for a picnic blanket, a bottle of wine and a rowing boat or two. From there we could see across the aquamarine water almost all the way to Cannes. Running past beachfront bars, boutiques and baguette-bearing, dog-walking locals, Megan and I continued to dodge the many puddles (though it had been raining all day it wasn’t in the least bit cold) as we headed through Juan-les-Pins, popularised by Peter Sarstedt’s hit song Where do you got to my lovely, and Golfe-Juan. Finally we entered the outskirts of Cannes, buffeted by a wind that us runners certainly didn’t welcome but that had attracted droves of windsurfers. 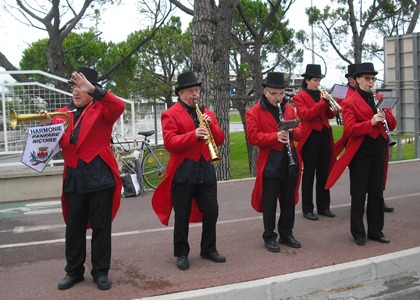 As expected, the finish, on the Promenade de la Croisette, catwalk to cinema’s greatest stars, was phenomenal. 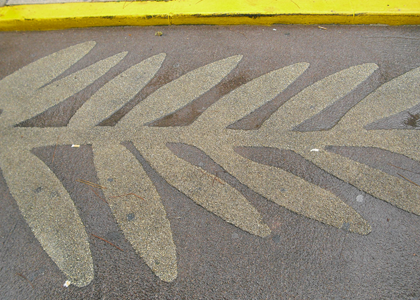 Where else in the world can you run past the Palme d’Or painted onto the tarmac under a canopy of palm trees to deafening cheers feeling like the star you undoubtedly are? – The course was mostly flat and 95% of it hugged the coast so we got sea views and lungfuls of salt-spray-laden air, a real treat if you’re used to slogging it out in sometime smoggy city marathons. An unexpected bonus was watching the sun rise over the water while waiting for the 8am start. – The organisation was superb and the race had an international air, with 8,200 runners from 62 countries taking part. Race commentary in the race village and at the start and finish was in both French and English so all of us 345 British runners were made to feel right at home. An impressive 24% of participants were women. 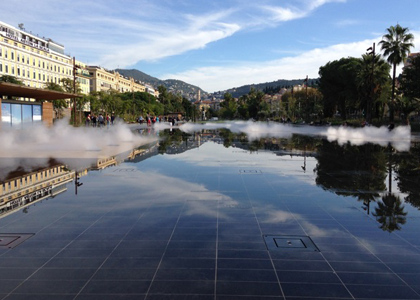 -While the rest of Europe is starting to shiver, the Côte d’Azur still has a wonderfully warm climate in November, making for ideal marathon conditions and a fantastic city break. – Powerade and Coke were available in the latter stages of the race but they served some truly unpalatable Sunny Delight-esque sports drink earlier in the race. It’s best to carry your own sports drinks tablets to mix with water if you think you’ll need isotonic drinks early on. – The aid station volunteers were amazingly supportive but crowd support was rather sparse, so don’t rely on it for a pick-me-up en route. – Quite a few of the bands had packed up before us back-of-the packers arrived, so take your own music if you want to run to a beat. 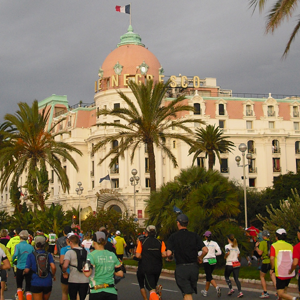 More info: Next year’s Marathon des Alpes-Maritimes Nice-Cannes takes place on 8 November 2015. For more information and to enter, visit www.marathon06.com. For information on the Côte d’Azur, visit www.cotedazur-tourisme.com.